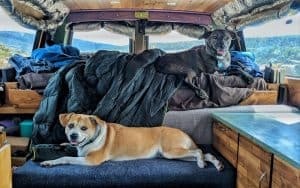 Turning a van into a home is an adventure. It forces you to learn new skills and deal with setbacks and screwups. But first and foremost it teaches you to be patient, to work hard, and to persevere in the face of obstacles. And with those skills, you can do anything. As we get ready to hit the road this week, we’re looking back on everything it took to ditch the chains of our old life and embark upon this new adventure. Our parents always told us we could be anything we wanted when we grew up. They did whatever they could to support our dreams, from paying for books and piano lessons to shooting hoops all day to help practice for a big game. Whatever our hearts desired, they were always there encouraging us that we could do it if we worked hard enough, if we had the patience and desire. Whether we wanted to be singers, directors, teachers, writers, carpenters or plumbers, they always assured us we were capable of doing it. Building this van has proven them right. We can be anything we want if we put in the work. 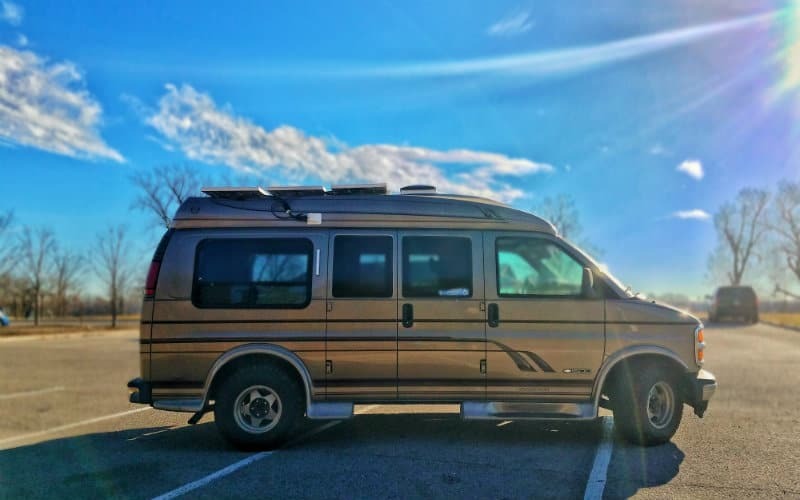 We bought this van only thinking about how we would be adventurers, but through the process of building our home we took on every job from demolition to tailor. First we were Researchers and Planners. We learned everything we could about the different vehicles out there. What’s the most bang for the buck, what’s the most reliable, what would fit most of our needs. 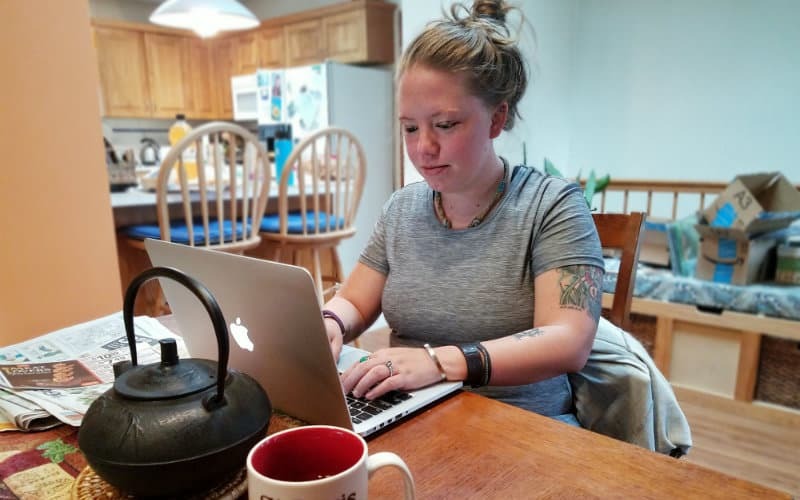 Before, Jayme might have been able to tell you the difference between a van and a car, but now she can point out Chevy Astros, Mercedes Sprinters, Dodge Promasters, and GMC Savannas – and tell you the difference between a Vanagon and a Eurovan. Then we were Salespeople and Negotiators. We learned all the ins and outs of selling things on Facebook, Craigslist, Offer Up, and yard sales. And we made over $10,000 selling just about everything we own. It took us nearly six months to get rid of it all, but we did it. After selling everything we put on our buying hats and worked out a great deal on our dream van home. 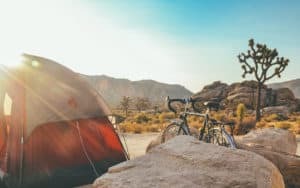 We became Photographers, Videographers, Editors, Graphic Artists, Web Designers, and Writers when we decided to document every step of our new van life through Instagram and a blog. We had so many questions about everything before we began (we still do, but figuring out the answers is the fun part!). We wanted to find the best way to answer the questions we had – especially the ones we couldn’t find straight answers for – so that we could help others on their own van life journeys. So Jayme became the one telling John to “jigsaw slower” (like that’s even a thing) to make sure we could show exactly what our steps have been in our van build. 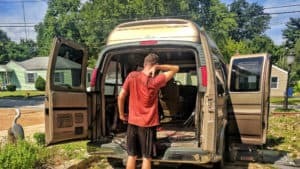 While writing this post, it’s been a lot of fun looking back on the photos of our totally gutted van, wires running everywhere, and thinking about how far we’ve come. When we bought our van, it was fully decked out with a wheelchair lift, leather seats, a TV, and mood lighting. That’s when we became Construction Workers (more like de-struction workers). We completely gutted our van all the way down to the metal frame. We then became Insulation Installers when we insulated the walls, ceiling and floor of our van, making sure our new home would be cool when we wanted it and warm when we needed it. Now that our van was gutted and insulated, we took our first foray into being Electricians. We did our best to consider our electrical needs, design a system, and research solar panels, batteries and other components. We mounted our solar panels on our van’s roof and ran as many wires as we could throughout the van. We cut a big hole in the ceiling and installed a Fan-Tastic fan. We still had a lot of work to do before we could hook everything up and turn on the electricity, but it was a start. Then we became Flooring Installers. We laid down a plywood subfloor and installed some sweet-looking laminate flooring on top. We had zero experience installing flooring. Before this part of the build, if you had asked Jayme if she knew how to do a t-lock install she would assume that was the newest dance move you could find at your local club. But through research, trial-and-error and lots of cursing, we did it. Once we got the hang of it, it turned out to be pretty easy. We continued our jobs as Construction Workers when we installed our plywood walls (Hint: We used a LOT of cardboard templates to get the shape of our walls just right). After we had the walls up, we put up our awesome cedar plank ceiling. And let us say, we’re SO glad we went with cedar. Our van now smells like heaven all the time (if heaven is a peaceful spot in the middle of the woods. Which it is). Next, we could hang up our construction gear for a little bit and become Painters (well, stainers, technically). 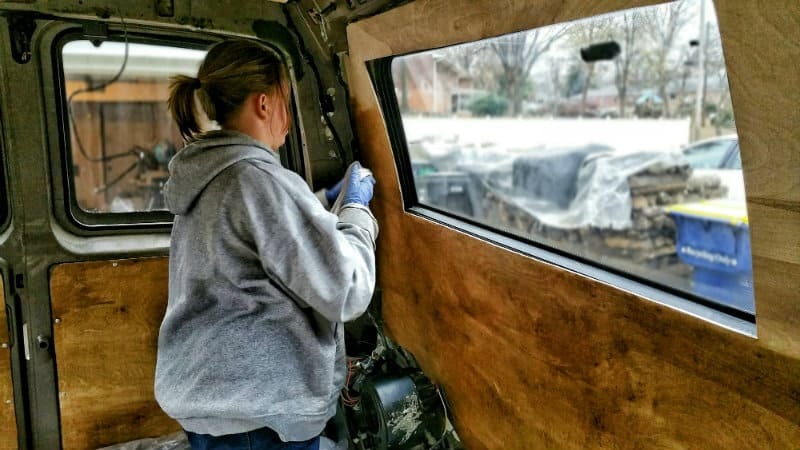 We always loved the homey feel of log cabins, and we wanted to do our best to make our van seem like one. So we stained our walls and our cedar ceiling many different shades to give it a mismatched, rustic look. It only took us a few hours to stain the whole van, and it transformed our bare wood interior into our little mobile lodge. Then we became Electricians again when we finished wiring our electrical system. 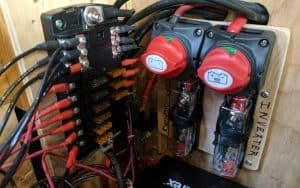 Electrical was by far the most intimidating part of this van build for us. We knew almost nothing going into it, and we knew that the lights not turning on would be the least of the consequences if we got it wrong. We had researched, and diagrammed, and researched some more. 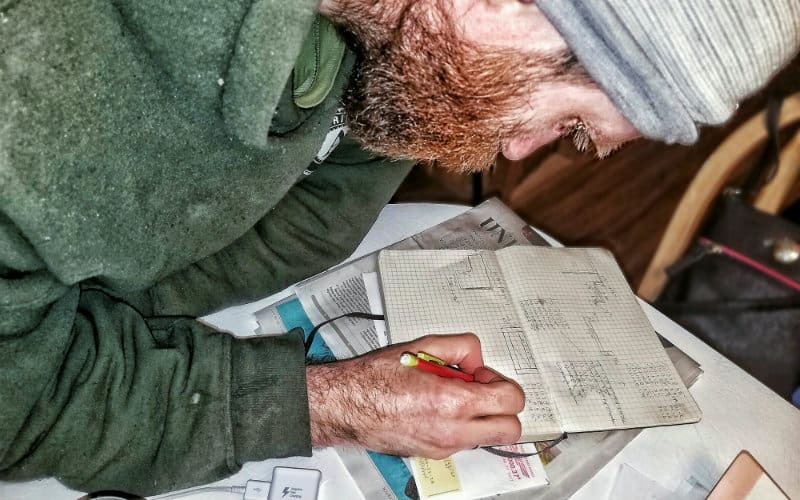 We found out everything we could about circuits, fuses, crimp connectors, wire gauges, and proper grounding. We had to understand all the ins and outs of how our system worked to avoid electrical hazards. 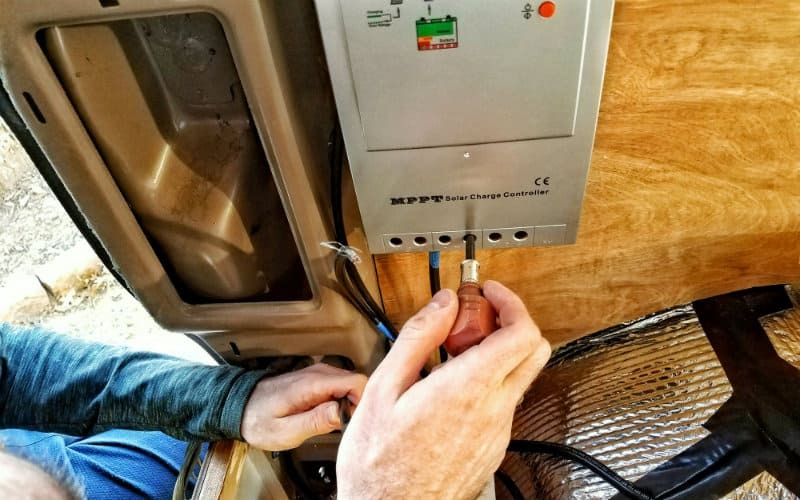 We used this information to install a working electrical system in our van, including outlets, an inverter, and dimmable recessed LED lights. Turning on the lights for the first time might have been the most exciting part of the entire build process. We did it right! We didn’t have to rip open the ceiling and check our wiring connections, or pull our hair out and go back to the drawing board. A bottle (or two) of champagne later, we got back to work. Next we became Architects, designing and drawing how the inside of our van would fit together. 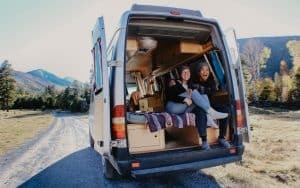 We borrowed ideas from van build blogs and Youtube videos, modified them to our needs, and came up with some of our own innovations. 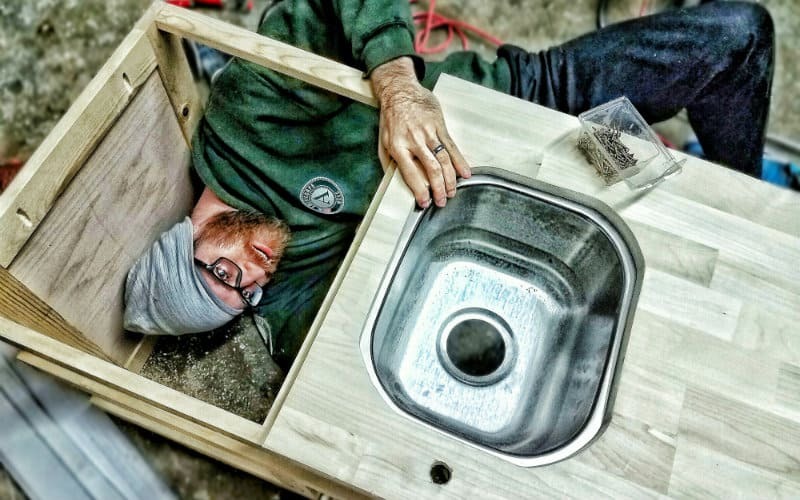 We designed a kitchen unit that holds a water tank, a sink, cabinets and a stove. 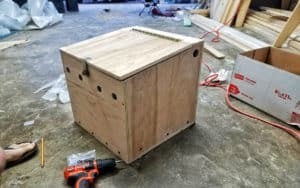 We created a bench that doubles as a storage unit and electrical station. We devised a way to have a queen-sized bed in our tiny space. 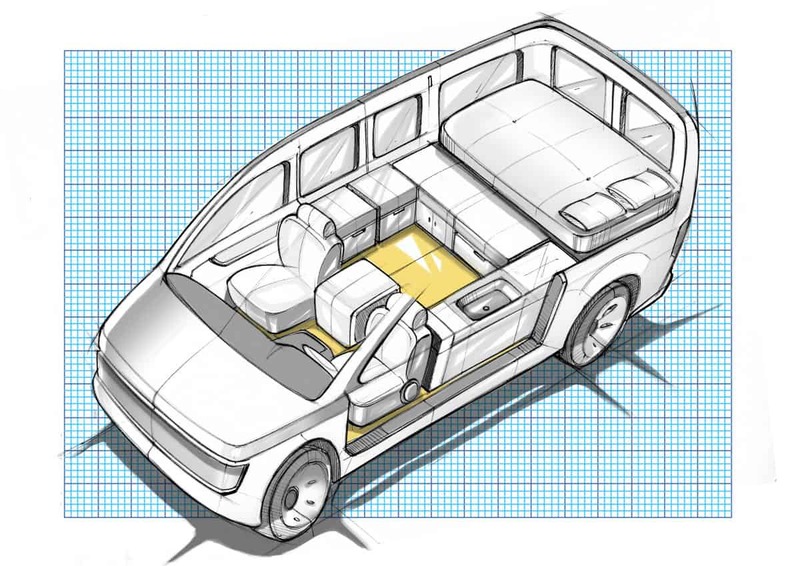 We came up with ideas for a flip-up table, a battery box, shelving, and more storage areas. We drew, and designed, and planned. And then we became Carpenters and we built. We became pros at using a jigsaw and a sander to make bland plywood look awesome. We learned a lot about putting everything together and making sure our furniture is both strong and light. We became Plumbers when we hooked up our water system, and we learned about different types of tubing and how they connect. We became Tailors when we sewed covers for our seat cushions and made insulated blackout curtains. We did everything in our van build. 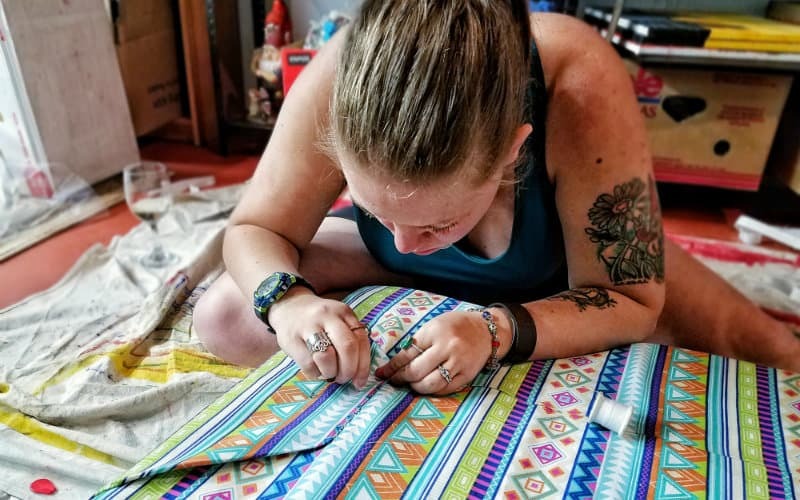 We joined wood to metal, wood to wood, wire to wire, fabric to foam, and found out that building a functional van that feels like a home is possible. Because we believed we could be anything, we knew that being plumbers, electricians, architects and carpenters was only a matter of hard work and perseverance. Now we’re off to be Explorers. Follow our adventures on Instagram @gnomad_home and Facebook at Gnomad Home. 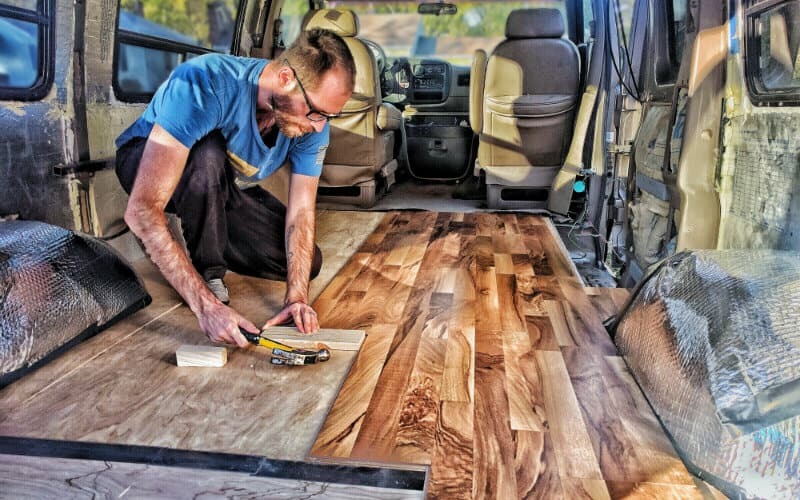 Stay tuned for more van build tutorials and updates from life on the road. Cheers! Well done guys! Enjoyed watching your dreams become a reality. You really can be what ever you want to be! All the best.